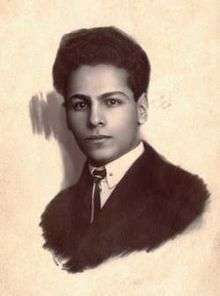 Ali Nazem (Persian: علی ناظم‎‎, Azerbaijani: Əli Nazim) – was an Azerbaijani poet, writer and literary critic of Azerbaijani literature. Nazem was born on 24 November 1906 in Tabriz. He graduated from the Leningrad Institute of Oriental Studies and later completed his postgraduate studies in Moscow, where he conducted research and teaching. In 1937 he was, together with A. Jawad, H. Javid, Mushfig, Musahanly, Yusif Vazir, S. Hussein, Cantemir, Talibli and A. Razi, declared an "agent of the German-Japanese fascism, Trotskyist, Musavat and nationalist deviators." In 1937, he was arrested and died in prison on 23 August 1941. In 1957 Nazem was rehabilitated. Ali Nazem, Назим / Под ред. Surkov, Alexei Alexandrovich. — Concise Literary Encyclopedia: Great Russian Encyclopedia (published), 1962. — Т. 5. — С. 96. Назим / И. К. Луппол, М. М. Розенталь, С. М. Третьяков, С. С. Лесневский. — Первый всесоюзный съезд советских писателей, 1934. Стенографический отчет. Приложения: Советский писатель, 1990. — Т. 2. — С. 56. Wikimedia Commons has media related to Ali Nazim.